A blue replica of the War Office Seal set on a white field. Beneath the seal is a broad scarlet scroll bearing the inscription in white letters, "UNITED STATES ARMY". Beneath the scroll, in blue sans serif Arabic numerals, is "1775". A white replica of the War Office Seal set on a blue field. Beneath the seal is a broad white scroll bearing the inscription in scarlet letters, "UNITED STATES ARMY". Beneath the scroll, in white sans serif Arabic numerals, is "1775". The flag of the United States Army displays a blue replica of the War Office Seal set on a white field. Beneath the seal is a broad scarlet scroll bearing the inscription in white letters, "United States Army". Beneath the scroll, in blue Hindu-Arabic numerals, is "1775", the year in which the Continental Army was created with the appointment of General George Washington as General of the Army. All of this is on a white background. The concept of campaign streamers began during the American Civil War, when the War Department instructed regiments to inscribe the names of their meritorious battles on their national colors. The Army has defined an official campaign as a particular combat action or series of actions that has historical significance or military importance to the U.S. and the Army. In 1890 the War Department directed that regimental honors be engraved on silver rings placed on the staffs of regimental flags. In 1920 the War Department ordered that each regimental color would bear streamers, in the colors of the campaign medal ribbon, for each campaign in which the regiment had fought. The creation of the Army Flag provided a means to display all the Army’s campaigns (175 in 2003). with grey above blue and may have different names for campaigns. ^ a b "Establishing a flag for the United States Army". Executive Order 10670. June 12, 1956. p. 324. Retrieved April 30, 2014. 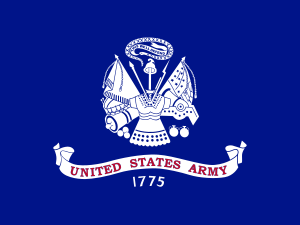 WHEREAS the Secretary of the Army has adopted, and has recommended that I approve, an official flag for the United States Army, the design of which accompanies and is hereby made a part of this order, and which is described as follows: UNITED STATES ARMY FLAG--The flag for the United States Army is 4 feet 4 inches hoist by 5 feet 6 inches fly, of white silk or rayon, with yellow fringe, 2½ inches wide. In the center of the flag is the central design of the seal of the Department of the Army (without the Roman numerals) in ultramarine blue, above a scarlet scroll with the designation "UNITED STATES ARMY" in white, and beneath the scroll are the Arabic numerals "1775"; AND WHEREAS it appears that such flag is of suitable design and appropriate for adoption as the official flag of the United States Army: NOW, THEREFORE, by virtue of the authority vested in me as President of the United States, I hereby approve such flag as the official flag of the United States Army. On such official flags of the United States Army as the Secretary of the Army may designate, there shall be displayed below the spearhead of the flagstaff one streamer for each of the officially recognized campaigns in which the United States Army has participated. There shall be embroidered on each streamer the name of the campaign and the year in which it occurred. ^ "United States Army Field Flag". ^ "WAR OF 1812 & MEXICAN WAR". tmg110.tripod.com. ^ a b "WAR WITH SPAIN & CHINA RELIEF EXPEDITION". tmg110.tripod.com. ^ a b "MEXICAN EXPEDITION & WORLD WAR I". tmg110.tripod.com. ^ a b "AMERICAN & ASIATIC PACIFIC WW II". tmg110.tripod.com. ^ "EUROPE WW II". tmg110.tripod.com. ^ a b "EXPEDITIONARY & SOUTHWEST ASIA SERVICE". tmg110.tripod.com. ^ "Wayback Machine". November 26, 2016. ^ "Iraq Campaign Streamers". Uniform Accessories Unlimited INC.
^ "Campaign Participation Credit and Campaign Streamers for Operation Inherent Resolve". March 10, 2018. ^ "Inherent resolve award streamer". www.guidonsandmore.com. This article incorporates public domain material from the United States Army Center of Military History document "The Origin of the U.S. Army Flag". This page was last edited on 1 April 2019, at 12:23 (UTC).